Martha Stewart’s Visit to ARTfarm! Happy New Year, dear farm supporters! We are very excited to say that we ended 2013 with a positive and thought provoking hour-long farm visit from vacationing celebrity Martha Stewart and a few friends. Martha found out about ARTfarm because one of the local private chefs she hired to do some (not all!) of the cooking during her St. Croix vacation shops at ARTfarm. After tasting our produce, Martha was curious to find out where her fresh salad greens were coming from! We were extra motivated to give her a farm tour, not only because we know Martha is a famous foodie who’s extremely knowledgeable about sustainable farming and artisanal food production, but also because Christina was her employee in the art department of the award winning “Martha Stewart Living” magazine in New York. AND, need we say, because it would be completely surreal and fun for us to have an international pop culture icon of the American kitchen and garden walking around the ARTfarm. We prepared our five-year-old for the visit by explaining that the ‘Martha’ coming for a farm tour was not the talking dog from the PBS Kids cartoon, but a real ‘princess’ like Audrey Hepburn’s character in “Roman Holiday” – this Martha had castles with pretty chandeliers and gardens and staff, and horses and fluffy cats, but also a lot of work responsibilities and a hectic schedule. She was here on St. Croix with her family to relax and ‘let her hair down’ AND she was about the same age as Grandma. So ‘Princess’ Martha, along with her MSLO colleague Kevin Sharkey and some family friends, arrived around 5pm on a Sunday afternoon, armed with sensible shoes and cameras. Yes, Martha is quite tall! She was relaxed, energetic and engaged, and immediately noticed Valeria’s orchids blooming in the trees. She and her friends all kept us on our toes with dozens of rapid-fire questions about the farm, crops, livestock, and growing methods, while simultaneously shooting dozens of photos and managing to charm the shyness out of our kid. ARTfarmers posing in the pasture with Martha Stewart! Note the beach-blown hair. Luca’s favorite moment: Martha picked up a fresh fig off the ground, ripped it in half and started eating it and sharing it with her friends, passing the other half back to Luca. Christina’s favorite moment: Slinging our cordless power drill in one hand, Martha executed an uncannily accurate turkey call which caused our second Tom turkey (who usually hides in the group, acting like a hen) to respond by puffing up in archetypal male turkey form. Perfect. As we surveyed the vegetable gardens, Martha told us about ingredients she’d discovered on her visit to St. Croix, and how she’d delved into local cuisine (I noted her trademark fearlessness and skilled hand), making conch fritters and soursop ice cream for her family and guests. They were all very excited about discovering fresh Caribbean fruits that are too delicate for export, like mamey sapote. “I’ve been putting that stuff in everything!” Martha exclaimed of recao, a.k.a. culantro/shado benni, the ‘cousin’ of cilantro we sell at the stand. (She collected a few seeds to start at home.) She was familiar with dragonfruit and fascinated to see how we cultivate the plants. She admired the red Senepol cows grazing in an adjacent pasture, and we compared home dairy aspirations. 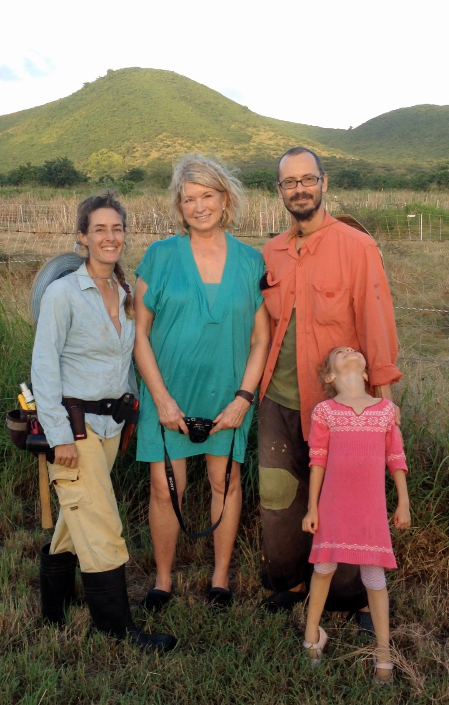 Luca and I felt commonality with Martha’s passion for simple, excellent food and growing what you eat, meticulously. You can sense one of the keys to her success immediately: she has a child’s fearless curiosity and ravenous appetite to learn something new. Nothing escapes her observation. Cross that child with a gracious 72 year old grandmother who gushes about her toddler grandkids and is eager to share many years of accumulated how-to knowledge in the garden and the home. (Add a pinch of drill seargeant.) She didn’t want me to forget my cordless drill in the rain, so she picked it up and carried it around. To be the recipient of this mama-hen practicality took me a bit by surprise. Pun fully intended. The public figure of Martha Stewart has always been polarizing. She’s the overachieving queen of the sparkling clean American house and perfect dinner party, a wildly rich and powerful female publishing and licensing magnate, and one–name A-list celebrity icon (along with Sting; Cher; Britney; Lindsay; the Donald) whose first name goes beyond proper noun to adjective, verb, and running cultural joke. The use of Her Name denotes a level of quality, even smugness, that seems curiously detached from what is deemed necessary in the ‘real world’ of packaged convenience: “I went full Martha and made my pie crust from scratch”, “My handstamped gift wrap is sooo Martha”, “I Martha’d up my dinner party with personalized origami napkin rings and rustic floral arrangements. Can you believe it?” or “I summoned my inner Martha and organized my closet by fabric type.” Eyeroll. Martha’s brand of domestic art can be a draconian standard to contemplate. For the average understaffed person trying to get through the messy realities of life (let alone the extra helping of salt spray, mildew, mold, bugs and dust that comes with island life! ), it doesn’t help that Martha is authoritative and unapologetic; she lacks the self-effacing, sympathetic delivery of other self-help gurus. In person she has a sparkling sense of humor, but she doesn’t wield it constantly, or automatically direct it at herself. She is cut from sturdier cloth. There’s something deeply retro – beyond ironic hipster retro – about Martha and her dignity and her obsessions with heirloom chickens and wreaths and root vegetables. She wants you to iron your tablecloths the right way, but she’s modern, too: CEO and Chairwoman and star of her own 638-million-dollar media enterprise, flitting between photoshoots and regular television appearances – and a trading conviction and time served for street cred. Who are we mere mortals to compete with that? Anyway, who can be so serious about housekeeping? In the decade plus of Christina’s professional graphic design and art direction work at various companies in New York City, there was never a tighter ship than the one that Martha helmed at Martha Stewart Living magazine. From the top down there was an absolute insistence that no miniscule detail of quality be overlooked. This made for a relatively serious workplace, but the level of focus was formative and one slept well at night knowing the rigorous product of your workday was as close to the razor’s edge of perfection as humans can achieve. 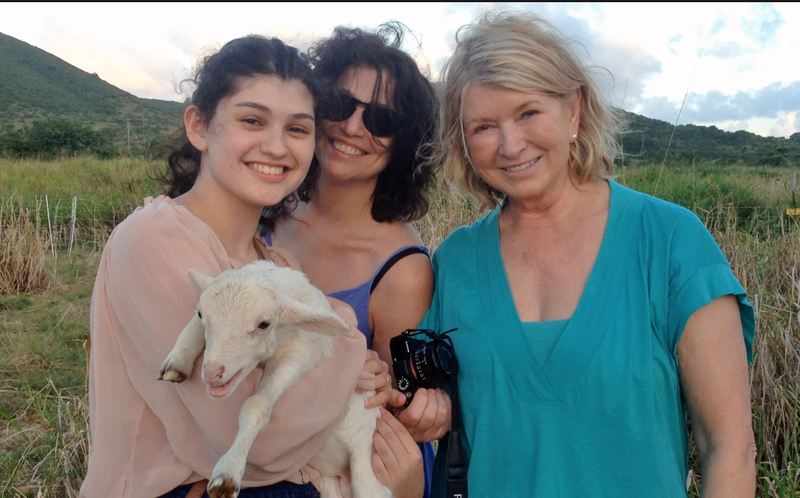 Martha Stewart and some family friends on vacation have snuggle time with a two-week-old lamb at ARTfarm. Martha is often dismissed as a frosty WASPy ‘beech’ (her word), and when I left the magazine in 1995 it was primarily because I wasn’t sure I was helping to make the world a better place. Back then she was a tough boss who seemed to regularly churn through personal assistants, but in meeting her again after so many years, my perspective on Martha and her message has enlarged. She IS patrician, but her intent is to inspire us to do the better job she knows we are capable of. And like most artists, she simply can’t help but immerse herself in her passions. We can envy her success, or judge how she spends her earnings, or be annoyed by her perfect tarts, but they are a direct result of compulsion plus talent, multiplied by opportunities seized. Love or hate the monarchy, but the power and trappings of celebroyalty are part of what attracts us to them in the first place; a brush with a princess elevates us, temporarily. It’s a rush of adrenaline. With Kmart as our only ‘big-box’ department store on St. Croix and Martha’s longstanding licensing agreement there (which ended in 2009), it is likely that many of us on our little island own at least one or two tastefully understated household items with Martha’s label affixed. The surreality was not lost on me of having Order Incarnate, whose name is on towels, sheets, an ice bucket, bowls, storage containers, and God knows what else in our home, standing in our cluttered kitchen. Graciously, she didn’t bat an eye as she shifted aside a pile of farm detritus on the entryway countertop to find the space to write down some contact information on a scrap of paper we had located for her. That low, distinctive, commanding voice paused all conversations in the crowded room, as she reminded me to give her the phone number of a neighbor. Boom. This lady has always had power, but she has been canny enough to direct it into the construction of an empire to broadcast her message. There she was, moments ago in my pasture, holding my drill like Rosie the Riveter: We Can Do It! The next day, I vacuumed like crazy, cleaned my dusty screens, attacked the laundry pile and got rid of a bunch of clutter. Thank you, Princess Grandma Martha. In 2014, let’s go big and go Martha: let’s not fear measuring up to our inner yardstick, and celebrate who we are. Let’s embrace power – our own and that of others. Let’s embrace the striving for perfection, accepting the likely possibility of falling short in our quest for balance and light. And broadcast our message as loud as we can. Bravo Christina. So well written. Sent from wherever I am! Good for you guys! I second a Bravo! I definitely think that should be the new Tshirt 🙂 What a perfect quote! So happy for the good words from Martha about you guys. And this is a beautifully written essay. Always one of my fave spots on island; I couldn’t wait to shop each week and see what new things you were working on. Plus, definitely the tastiest salad mix and the best pineapples I’ve ever eaten!